We have a new winner. Our 4 pack winner can't make the show and was kind enough to let us know in time to pick another name. Congrats to our new winner, Alicia S.
Uke can have a jammin' good time from 11am with Little Miss Ann all day long till 11pm. There'll be something for everyone with BBQ, and great ukelele songs ranging from traditional to alternative and everything in between. Chief O'Neil's has sweet outdoor open space and seating and the fest will cover both indoor and outdoor space. Come out and dance. 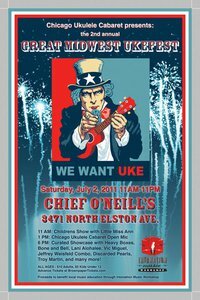 Click HERE for more details on The Great Midwest Ukefest.